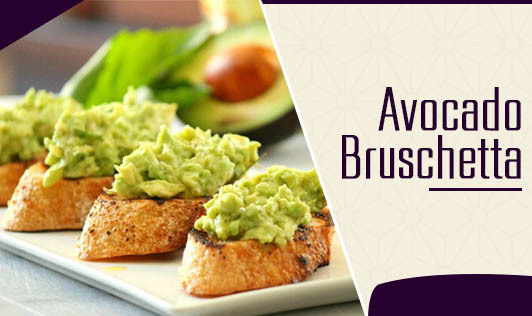 Avocado replaces cheese in this recipe to give you an extremely creamy low-calorie starter. Chop the tomato and onions into small pieces and set aside. Spread the bread slices on a baking sheet and bake for 10 minutes, turning them over at halftime, until the bread is toasted. Meantime, scoop out the avocados into a bowl and mash them with a spoon to make a fine paste. You can even blend it if you want a smoother consistency. Add the lemon juice, salt, pepper, and mix well. Scoop out a tablespoon of the mixture and spread it on the bread slices. Garnish with chopped tomatoes and onion.